18.02.2018 | 5 Min. | Quelle: NDR Norddeutscher Rundfunk: by Guido Pauling. Silence, Gabriela Torres Ruiz, Hatje Cantz Verlag. If you would like to purchase a signed book, just send me an email. The cost is 40€ plus shipping. -"This is indeed a strong series of images in a convincing sober dialogue / montage". By Catherine David, French art historian, curator and museum director. David is currently deputy director of the National Museum of Modern Art (Musée National d'Art Moderne) at the Centre Georges Pompidou. Paris 21.05.2018. -Response to the photographs in Gabriela Torres Ruiz, Silence. By Michael Edward Moore, Professor of Medieval and European history at the University of Iowa, College of liberal Arts and Sciences. USA 08.04.2018. -Serenidad. By Rodrigo Moya. Mexican photojournalist, writer and publisher. México 17.03.2018. -NDR Kultur. Die Aura verlassener Orte. Germany 18.02.2018. -De l'art helvétique contemporain. By Jean-Paul Gavard-Perret, writer and critic of contemporary art and lecturer in communication at the University of Savoie. Member of the Imaginary and Creative Research Center, specialist in Twentieth Century Image and the work of Samuel Beckett. Switzerland 08.11.2017. -lelitteraire. By Jean-Paul Gavard-Perret. Switzerland 11.11.2017. -Aesthetica Magazine. Elegiac Sequences. England 16.11.2017. -derStandard. Silence: Zeit zur Einkehr. By Gregor Auenhammer, historian, philosopher and psychologist. Since 1988 head of production planning and reviewer for the newspaper "Der Standard". Austria 29.12.2017. -Swiss - Architects Magazine. Stille. By Jenny Keller. Switzerland 20.12.2017. -German Photography Society. Germany 12.2017. -Der Tagesspiegel, Mehr Berlin. (Article in printed version). Saturday April 22, 2017. By Christiane Meixner. -Gazeta Wyborcza, Warsaw. (Article in the Culture Magazine from the Newspaper Gazeta Wyborcza, Polen) Silence, Gabriela Torres Ruiz, solo exhibition, Galeria Trzecie Oko - Leica Cracow, Poland. -Europa City, Berlin, Germany. Fishing district in the south of the city. (Project presentation, design and development of facades with Jan Kleihues and Götz Kern). Special mention. -University of Applied Sciences in Regensburg, Germany. New building for the Faculty of computer and mathematical science. (Design and development of facades with Jan Kleihues and Johannes Kressner). Second prize. -Headquarters offices of the Volksbank Lippstadt, Germany. (Project presentation, design and development of facades with Jan Kleihues and Götz Kern). Third prize. -Extension of the Stadthalle Heidelberg, Germany. (Design and development of facades with Jan Kleihues and Johannes Kressner). Special mention. -Reconstruction of the Berlin Castle / Humboldt Forum. (Project presentation design and development of ground plans and facades with Jan Kleihues and Götz Kern). Third prize. -Redevelopment of the old Wertheim areal in the Leipziger Platz, Berlin, Germany. (Presentation of project, design and development of facades with Jan Kleihues and Götz Kern). First Prize. -History Museum on Römerberg, Frankfurt, Germany. (Presentation of project, design and development of facades with Jan Kleihues and Götz Kern). Second prize. -Culture and Congress Centre, Regensburg, Germany. (Presentation of project, design and development of facades with Jan Kleihues and Götz Kern). First prize. -Conceptual Realities, interview with Gabriela Torres Ruiz, Aesthetica Art Prize 2016, nominated artist. -Silence, solo exhibition Gabriela Torres Ruiz at Trzecie Oko Gallery, Krakow, Poland. -Interview with Gabriela Torres Ruiz, Aesthetica Art Prize 2016, nominated artist. Shortlisted for this year’s Aesthetica Art Prize, Gabriela Torres Ruiz is a Mexican-German artist based in Berlin. Her diptych #1, from the series Silence, was exhibited as part of the Aesthetica Art Prize 2016 showcase at York St Mary’s earlier this year. In this work, she uses photography to preserve her own personal experience of silence, in nature as well as in spaces of disintegration and decay, to indicate the inevitable and progressive passage of linear time. We speak to Gabriela about her practice to offer an insight into the themes surrounding her work and inspiration. 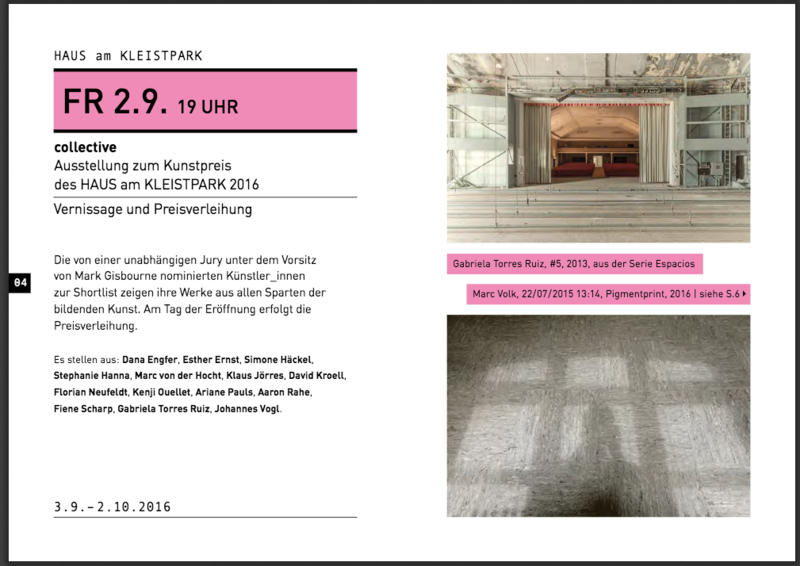 -Haus at Kleistpark´s Art Prize Exhibition 2016, nominated artist. Annually grants the municipal galleries Tempelhof-Schoeneberg-Berlin, the House at Kleistpark´s Art Prize. The tender in 2016, under the theme collective is with a cash prize of 5,000 euros and for the nominated artists from the shortlist with an exhibition from 2.9. (Opening) - 2.10.2016 in the House at Kleistpark. The jury consists of Mark Gisbourne (Chairman), Barbara Esch Marowski (gallery director), Elisabeth Lux (artist), Thibaut de Ruyter (curator and art critic) and Diana Sirianni (previous winner). A total of 190 artists have applied. The nominees for the shortlist are: Dana Engfer, Esther Ernst, Simone Hackel, Stephanie Hanna, Marc by Hocht, Klaus Jörres, David Kroell, Florian Neufeldt, Kenji Ouellet, Ariane Pauls, Aaron Rahe, Fiene Scharp, Gabriela Torres Ruiz, Johannes Vogl. -Shortlisted for the Hariban Award 2016, presented by the Benrido Collotype Atelier, combines a 150-year-old analog technique with the new vision of digital-age photography. Kyoto, Japan. -Photomed, selected as part of the 12 winners of the Festival de la Photographie Mediterranéenne, with the series Arraigo, Sanary-sur-Mer, France. Art director: Philippe Serenon. Exhibition catalog. -Shortlisted for the Aesthetica Art Prize, York St Mary´s, York, UK. Aesthetica Magazine and York Museums Trust, with the series Silence. Exhibition catalog. -Extrañamiento, Gabriela Torres Ruiz and Nin Solís, Casa de las Culturas Contemporáneas, BUAP, Puebla, Mexico. Exhibition catalog. -Winner of The Fifth Annual Exposure Award. New York. Digital display at the Louvre, Paris. Exhibition catalog. -First Prize at the 9th Dave Bown Projects, Art Competition, New York. -8th Arte Laguna Prize, exhibition of the shortlisted artist in the Arsenal of Venice, (special mention in photographic art). Exhibition catalog. -Prize for the best photographiy at The Pure Art Festival, Battle, UK. -Last Paradise, Triennial Exhibition of Visual Arts, Museum Chiostro del Bramante, Rome. Exhibition catalog.